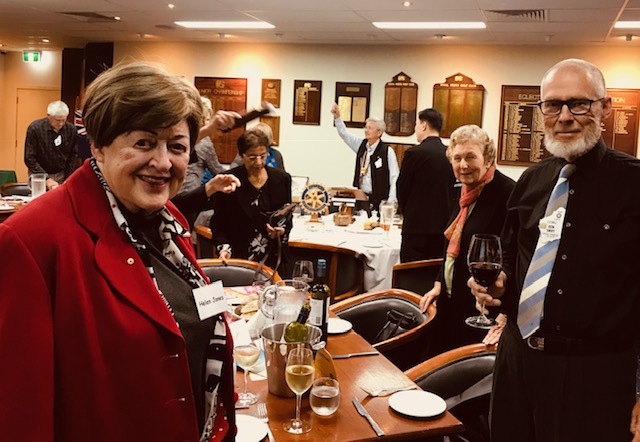 Helen Jones attended the meeting at RC Como where she was hosted by Rotarian Don Swift, a distinguished chemist formerly with CSIRO. Como is the largest Club in District 9465 with over 50 members, meeting Monday evenings at the Royal Perth Golf Club. There were 40 members and guests (mostly partners of members) at the meeting, and included a couple of younger members, both of whom are former Rotaractors. Como has a major event coming up at the weekend following the meeting, the 7th annual Classic Car Show, so that occupied the attention of Como members. The funds raised are used to support its charitable activities, in the same way as Rotary Jacaranda Festival does for Applecross Rotary. President Sakkiti Punyanitya can be seen in the background waving a greeting to one of his members, shortly before proposing the Loyal Toast to the Queen. Como is quite a traditional club, using the standard Rotary Grace, and finishing the meeting with the singing of the National Anthem. The speaker was from the RAC and Helen was hoping to get an insight into the future of electric vehicles since the RAC is conducting research in this area. But apparently the speaker felt it was better to talk about seniors and their driving abilities!